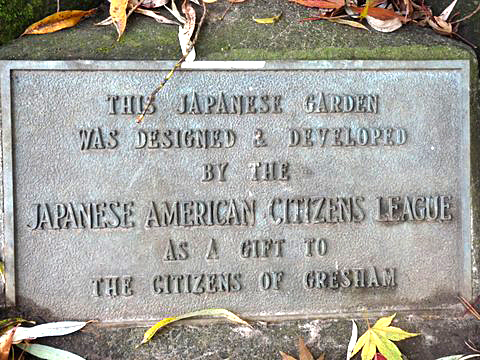 This is where the story begins in regards to the Gresham Japanese Garden. The island was free standing and as part of the project, a bridge had been built to connect the mainland and the island and area was most likely just called the island. This piece of land was about an acre based on the pictures and maps that we have available today and had more land on the northwest and east sides than we see today. Along with these changes involving the creeks and the surrounding area, Main City Park had the lower baseball field and a large refreshment area similar to the area we have today and lots more. Japanese American Citizens League begins discussions about building a garden on the island. As time goes on, we may gather information to help us realize just how the conversations at the Japanese American Citizens League began to consider the area recognized as the “Island” to become “Tsuru Island” as it is known today, as well as where the money came from. Plans were presented to the City to utilize the tiny plot of land and develop it into a Japanese style garden. Drawings were made and approval was granted. We also know the bridge was designed by a volunteer with the JACL. The JACL developed a committee to work with the garden designer, who may have been a member of the organization, to find materials and figure out a way to get those materials to the work site. Much of the garden was built during the fall and winter months and it is assumed it was because many of the volunteers were farm people in the community, growing vegetables, fruits, flowers and other farm products; those months were part of the non-growing season that would allow them some time to volunteer for such a project. A lot of the details of the project at the time are unknown because most of the garden build information was not written down or has been missed placed, but we do have picture documentation available of the garden being finished and the ceremonies taking place for the dedication. 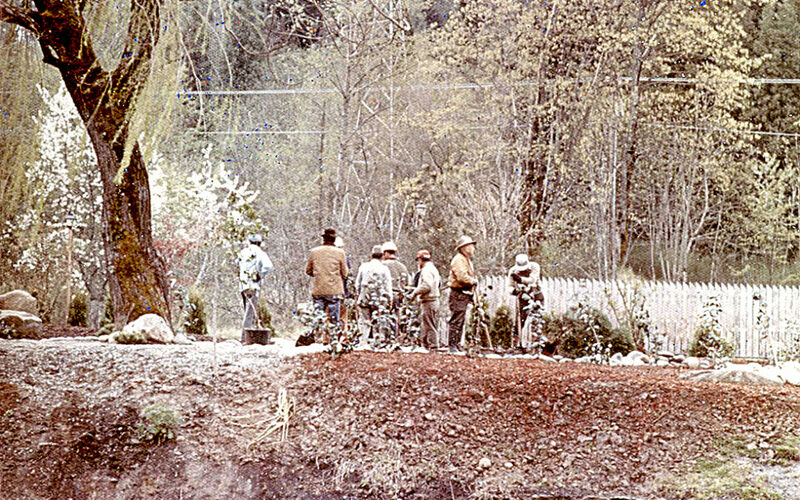 Much of the information is available at the Gresham Historical Society and many pictures exist of the garden’s development. Pictures showing the camellia being planted, pines that can be recognized today are on site. Those azaleas that flank the two sides of the bridge on the island were 1-gallon plants that were blooming as they were being planted which means that was happening in the month of May.